Samson has made a name for itself by releasing a series of low price, decent performance digital audio recorders including the Samson Zoom H2, H4, and H4n. These machines range in price from around $200 to $350 and they’re great for podcasters, good for musicians, usable, if not exactly perfect for pro audio users including radio journalists. Now Samson is dipping its toe into the portable video recorder space with the Samson Zoom Q3. This $250 video recorder has a built in mic that’ll put the microphones in other handheld video cameras to shame. The recorder can record in WAV or MP3 formats. In audio-only mode you can record in 96kHz/24-bit quality. If you’re recoding audio and video at the same time it tops out at 44.1/48kHz 16/24-bit WAV or MP4.The Q3 has a the same mic capsules used in the Zoom H4n. As for video, it can do 640 x 480 pixel video in MPEG-4 format. The recorder ships with a 2GB SD card which should be enough to store up to an hour of recordings. You should be able to fit 16 hours of video on a 32GB SDHC card. It’s not exactly HD video, but it should be good enough for those little home movies you upload to YouTube. The Q3 has a 2.4 inch, 320 x 240 pixel display for monitoring recordings, and a USB port for connecting the camera to a computer for transferring files. The recorder runs on 2 AA batteries and includes software for editing videos and an application for uploading movies to YouTube. It should be available in September. 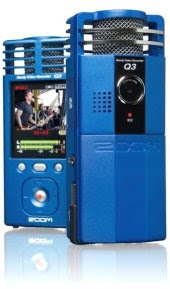 I bought Q3 recorder from a friend who had used it to record jam sessions, and it does a great job, however, I am having trouble transfering the video with the audio to my HD. It works fine through the HandyShare program, but the audio isn't there when I try to play it from the file on the HD. Is there a program I need to use to get it to work, or do I have to use the HandyShare program all the time? Also, I want to transfer the video's to a dvd for safe keeping for my grandkids for the future.